You could have been into Cosmetics for 10 years and still be baffled by Makeup Brushes and how to use them. As time progresses, new glitzy items hit the shelves and it's nice to have a guide to keep you on the right path. After all, these are the tools to a flawless face. 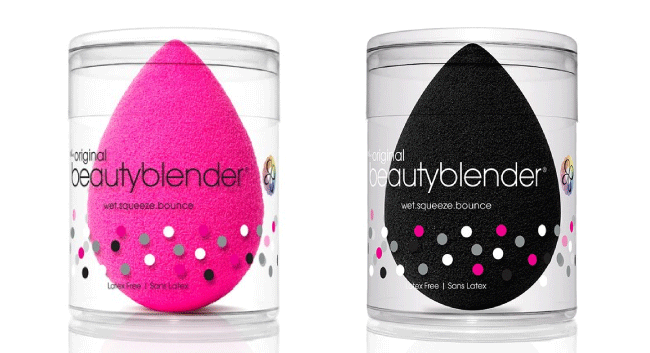 Beauty Blender*: Can be used to apply Face Creams, Primer, BB/CC Creams as well as Foundation. Will produce a sheer finish, that can be build on. Dampen to use and ideal for blending contour and applying powder for 'baking'. Foundation Brush*: If you like a medium coverage and like to get into every nook and cranny, then a brush is ideal. Can leave streaks at times, depending on the quality of the bristles and the product used. Also good for precise application of Cream Contour. Silicone Blender*: Is used to 'bounce' Foundation onto the face. Will provide a full coverage which is especially ideal for nights out or fashion makeup. Kabuki Brush*: Used to 'swirl' on Mineral Foundations and Powders. Can give anything from a sheer coverage right through to full as can be used to build up a base. Stippling Brush*: For 'stippling' on Foundation - just as it sounds. Great for applying makeup to textured skins and enlarged pores for that airbrushed finish. Fingers: Not a Makeup Brush but a popular tool for many cosmetics users. Will give a full coverage, but watch out for streaks. Always wash hands too beforehand to prevent bacteria spreading, leading to spots. Powder Brush*: Finish off your look with a Setting Powder or Veil. Used to sweep the product on gently. Round Buffing Brush*: Used in a 'buffing' motion to blend in contour, blush, highlight or any other facial product, thus leaving a smoother finish. Angled Blush/Contour Brush*: Create shadows and contour with this Brush. Best used for Blusher or Bronzer in powder format. Concealer Brush*: Used to cover any blemishes, pores, or flaws with Foundation/Concealer products. Also useful for 'cutting' in around the brows or on the eyes for clean lines. Fan Brush*: For gently patting on highlight on to high points of the face, or equally as effective to sweep off any excess product. Angled Brow Brush*: Used for applying Brow Powder, Cream or Gel for voluminous eyebrow. Flat Eyeshadow Brush*: Great for patting on loose Eye Powder, Shadows and Pigments. Can be dampened to enhance depth of colour. Can come angled too, which is great for doing that 'outer v'. Large (Eye) Blending Brush*: Can be used with Eyeshadow to wash the whole lid with colour, or used in a light buffing motion to blend. Medium Eyeshadow Brush*: Perfect for putting colour across the full surface of the eye. Smudger Brush*: Use to smudge Eyeliner and/or Eyeshadow under the eyes. Fine Liner Brush*: Get that perfect Eyeliner flick with this brush. Can be used with Gel or Liquid Eyeliners. Spoolie*: Great for applying Mascara, Brow Products or for grooming the eyelashes or eyebrows. Fine Liner Brush*: For lining around the lips, before filling in. Can be used outside the lipline for give a fuller look. Large Lip Brush*: Used to cover the full surface of the lips with Balm, Lip Colour or Gloss.